There are two main kinds of chain lubricants for bikes: traditional grease-based sprays and dry lubes. The general rule of thumb is that you should use both types: the dry lube in summer and the grease-based in winter. The main advantage that comes with grease-based motorcycle chain lubes is that they will cover the chain in its entirety, thereby protecting it from corrosion and rusting. Further, this lube type will ensure that your lubrication lasts longer. As mentioned above, there are two main lube variants in the market: aerosol and paste. Understanding the differences between these two is crucial for the overall performance of your bike chain. In case you need something that is easy to apply and will remain clean over the long haul, you might want to reach out for paste. 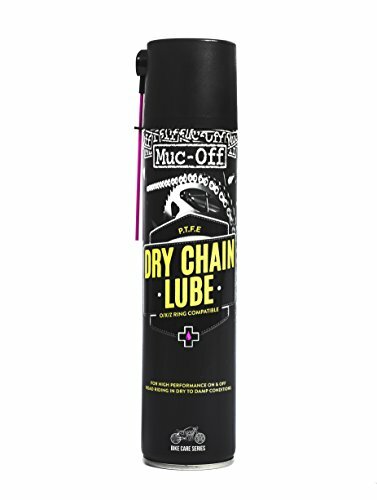 This type of motorcycle chain lube isn’t quite as messy especially because you’ll have more control as you apply it to your bike. Aerosol Lubes work best when you are looking to apply the lube fast and/or you are pressed for time. All you need to do is spray the lube on, turn the chain a couple of times, and you’re done. That said, both of these types offer pretty much the same benefits because they are made of the same product. Further, both are likely to adhere to your chain as long as you cleaned it prior to application. Therefore, what you end up choosing is a matter of personal preference and the amount of time you intend on spending on the application process. Pricing – The lube should cost what you are willing to spend. Efficiency – Get the lube that will allow you to apply the right amount with minimum dripping and overspray. Sprayer – The spray shape and volume should be powerful enough to get the job done. It should also allow precise control over the delivery of the lube. ​Effectiveness – Get a lube that works. 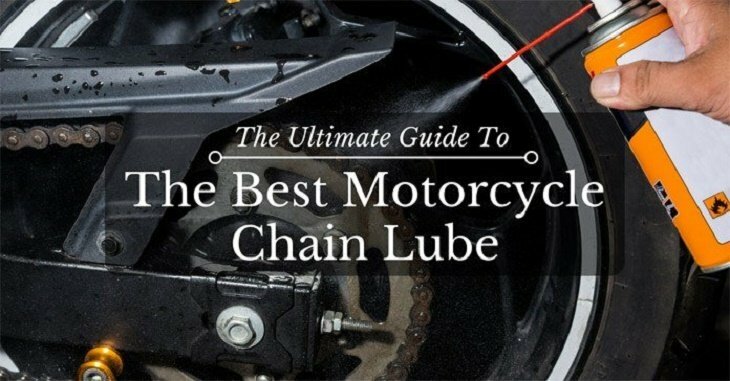 ​Ease of Use – The lube you buy should be easy to apply on the motorcycle chain. Resistance to Fling-Off – Your lube of preference should stick on the chain without dripping all over the swingarm, wheel, and elsewhere. ​Stickiness – Greasy and sticky motorcycle chain lubes tend to attract chewing gum wrappers, pollen, dust, and dust which could affect the effectiveness of your chain. ​Durability – Where possible, get a chain lube that will last at least long enough before you next have to re-lubricate your bike. Availability – Last but not least, only go for lubes that you can buy with little to no effort. Not all waxes and lubes are perfect for every bike chain and riding style. As such, there are a couple of things you need to remember as you go shopping for the best lube for your bike’s chain. While almost every chain lube is water resistant, fewer still are dust resistant. As such, if you sometimes take your bike off-road, then you might want to invest in a dust resistant lube. That said, a couple of the motorcycle chain lubes you’ll find on the market are designed for certain chain ring types. Although all of the waxes and lubricants discussed in this guide are perfect for use with O-rings and will work well for X-rings and non-O rings, a couple of other lubricants might not be quite as versatile. Last but not least, you should only apply lube to a clean chain. While lubricating your bike’s drive chain, it is important that you consider a couple of things. Knowing how to apply the lubricant properly will ensure that it remains functional and in great shape over the long haul – all the while functioning at full capacity. Before you get started, ensure that your chain is clean. After all, the whole point of applying lube is to ensure that it sticks to the drive chain and not to the dirt that might have adhered to the chain. Try as much as possible to get rid of all the dirt inside the chain. You can easily get rid of interior dirt using a nailbrush or a paintbrush. While cleaning your motorcycle chain, turn the wheel. By so doing, you will end up cleaning the chain in its entirety – instead of the small section that is visible to you. Of course, you should be careful as you do this to ensure that your fingers don’t get stuck while turning the chain. Before you apply the motorcycle chain lube, you should check that the entire chain looks like bare metal. Only by so doing will you be able to ensure that the lube sticks to your bike’s chain and not just to a couple of clean sections. To properly clean your chain, slightly dampen a piece of cloth with motor oil. The oil will act as a natural kind of soap, and it will make it easier for you to remove debris, dust, and dirt from the chain. As you apply, ensure that the lube goes on the chain itself – and not on your bike. This is also the case with the motor oil and particularly so with aerosol chain lubricant. Taking good care of your bike’s chain is crucial to the overall performance of your motorcycle. Apart from preventing severe damage and prolonging the life of your chain, the lube you use will keep you riding well and safely over the long haul. Although all of the above rank among the best of all bike chain lubes on the market today, our pick would be the PJ1 1-06A Black Label Heavy Duty Chain Lube (Aerosol), 5 oz. We particularly liked the fact that it comes in an aerosol can, meaning that the application process is incredibly fast, efficient, and simple.